As I was looking around my plastic bag collection, the Dollar General bags jumped out at me. I had to figure out what to do with them - something different. As the wheels were churning in my head, I noticed my Louet wheel sitting there looking sad and lonely. That's when I decided, it was time to introduce another plarn color combination. 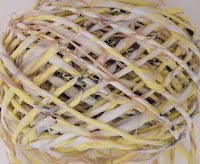 I thought the yellow with black (Dollar General) plastic yarn and white with black (Winn Dixie) plastic yarn would be a perfect match. It reminded me of a sunshine day. I looked outside my window and saw how windy it was and decided that my new concoction needed to reflect that as well. That's when I decided to throw into the mix the Raffeta. After it was all spun, this was exactly what I envisioned it would look like. I wanted to make sure that all 3 colors stood out and not one dominated more than the other. I did discover that while spinning with raffeta was fun it was also challenging because it kept getting caught in the spokes on my wheel. I haven't quite decided what type of bag/tote to make with this yet. But one thing I know for sure, what ever the finished product ends being, it will definitely be ooak. 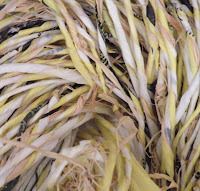 The raffia-plarn mix is beautiful. 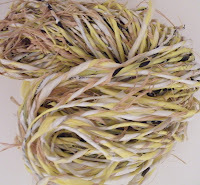 I've never heard of plarn and can't wait to learn more through your blog. I think it's a beautiful way to take care of all of those bags.